Ag3derm keratosis removal kit contains enough solution to remove up to 10 large keratoses. 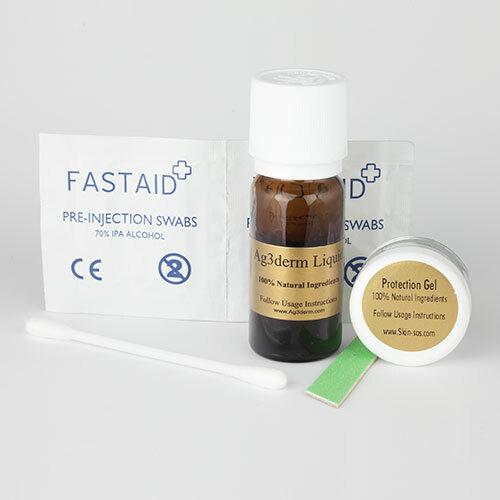 The Ag3derm keratosis removal kit contains enough solution to remove up to 10 large keratoses. First, use the emery board to roughen the surface of the keratosis if it is old & thick. Next, apply a layer of protection gel to the skin surrounding the keratosis. Wearing the latex gloves, then apply the keratosis removal solution to the affected area. A mild stinging sensation is normal. You should leave the solution in place for 15 – 20 minutes, during which time it will begin to bubble & attack the surface of the keratosis, leaving a white residue as it dries. Simply rinse with water & a tissue after the treatment. You should repeat the treatment twice per day for up to 14 days. More or less treatment may be required depending on the keratosis. The keratosis will dry & form a scab which will fall off naturally. You should not pick the scab as it may cause scarring. Using the applicator provided, carefully apply a layer of the protection gel around and up to the very edge of the keratosis to be treated. Next, carefully remove the child-proof cap from the keratosis removal solution and using a clean applicator apply the solution to the affected area. I could not believe what I was seeing – the solution was bubbling & destroying the keratosis before my eyes! My girlfriends are all asking me how have I gotten rid of the seborrheic keratosis from my face with no scarring? To be honest – I don’t want to tell them! Does that make me a bad person? Desde que he descubierto su loción queratosis, y tratados con éxito, me han prometido. Nunca volverá a ir en el sol sin al menos un factor de 30 crema solar en mi cara.